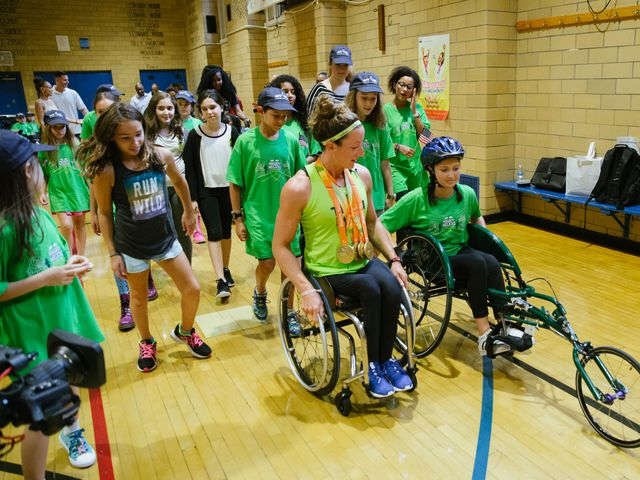 Two days after winning her sixth and final medal of the Rio Paralympics, Tatyana McFadden was teaching kids at a wheelchair racing clinic, hoping to inspire a new generation of champions. McFadden, 27, who trains in Champaign, Ill., returned to the United States after capping her Paralympic Games with a silver medal in the marathon Sunday, crossing the line in a photo finish second to China’s Lihong Zou. The two finished in 1 hour, 38 minutes, 44 seconds, setting a Paralympic record. The American won a medal in each of her six individual races, which started at 100 meters and went up to the marathon. Her four golds and two silvers tied her with swimmer Jessica Long for the most medals won by a U.S. athlete in Rio. Tuesday she spent time with the New York Road Runners Mighty Milers at PS 333, Manhattan School for Children. The program teaches youth with a physical disability the fundamentals of wheelchair racing.